and another Spain which yawns. to the world, may God watch over you. will make your heart freeze. I'd like to write my own version of this poem, one which is not so distant from the original, but can be read in a completely unrelated context and given new meanings. If I just replace "Spaniard" with "Argentine" and "Spain" with "Argentina" with a few other slight adjustments, I could accurately describe the reality of life in Argentina—or better said, the realities of life in Argentina. "Little Argentine Who is Coming to the World"
and another Argentina which summers. and another Argentina which abuses. and another Argentina which is for River. and another Argentina which is the interior. This post may be controversial. I don't want to take sides, though naturally or even unconsciously I fall into one or the other of the categories, though there are many more than the ones I included. It has been a month since Mauricio Macri assumed as president of Argentina, breaking the 12-year administration of the Kirchners. During his first month, Macri has made decisions which have elated half the population and distressed the other. I also don't want to get into details, after all this is a blog about a yankee goalkeeper in Argentina, but this was the first presidential election I witnessed outside of the United States. 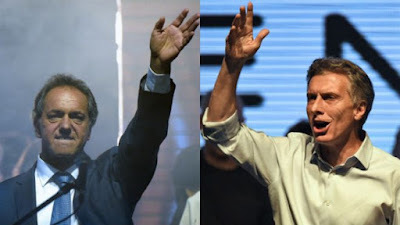 The night Macri won, there were tears and cheers, tears and cheers of joy and hope from those who voted for the winning candidate and tears of despair and sadness accompanied by cheers of farewell to the exiting president from those who supported the Kircherista candidate. The silence which permeated the streets of Buenos Aires on election day was reminiscent of the silence which reigned during the World Cup final in July 2014 as Argentina lost to Germany in extra time. The cheers and honking horns and celebration were also similar to the post final bittersweetness felt by the entire nation; however, this time, only half the Argentines felt like celebrating, while the other half displayed its anger, disappointment, and melancholy while continuing to support its political leader. Here's where football comes in. After election day, during the week leading up to Macri's inauguration and even afterward, there were manifestations from both sides, but manifestations which more closely resembled a crowd, or an hinchada, in a football stadium. Chants led by political faction leaders, cheers, drums, and applause as the crowd demonstrated their support, whether for the victor or the defeated. Boca and River were not present, but the striking difference in the colors of the masses' clothing brought back memories of superclásicos, the white and celestial blue of the Frente Para la Victoria (Kirchner's party) versus the bright yellow of Cambiemos (Macri's party). Banners, flags, and arms waving, the smell of barbecue wafting through the air as many took advantage to put food stands along the way, selling the famed choripan (chorizo sandwich) and cold drinks on the hot summer day. Passion. If one can compare football and politics in Argentina, maybe passion is what most closely ties them together. Passion in football is what drives a fan to cry when his team loses and occasionally when it wins, to hug a stranger after a goal or to punch a rival fan without any real reason than the color of his jersey, to travel miles and miles to see his favorite players, his idols, his escape from the dreary reality of work, routine, and the stress of daily life. Passion in politics is what drives a voter to cry when his candidate loses and to cheer and dance when he/she wins, to hug a stranger after a tight election victory or to punch someone who wore the other party's colors, to travel miles and miles to see his candidate or president give a speech in person under a brutal hot summer sun only to return to the dreary and often brutal reality of daily life. Passion is not a bad thing. It can be a great thing. It can lead to a loving relationship, a successful career, unforgettable memories, but unharnessed and without a touch of "reason", it can also become poisonous. (I hope you'll forgive me the metaphor, a tool which can often be helpful in the communication of an idea but at the same time can restrict it and make the orator seem demagogic or pedantic.) I fear that uncontrolled passion in politics is a situation which can lead to significant problems, passion without reason can blind and divide. Today if you read the news in La Nación or Clarín and then grab the opposition's paper, Página 12 or Tiempo Argentino, more than likely you will conclude that you are not living in the same country. Two realities are described, two "truths," two versions of everything that happens. This didn't begin with the change of president but is the continuation of a progressive polarization of the media and of society. It is a polarization which transcends class, gender, or skin color, though there are polarizations within those categories as well. Two Argentines see the same event, hear the same speech, read the same law, and arrive at two opposing conclusions. Perhaps the most obvious example of this was after the presidential debate previous to the head-to-head elections in December 2015. I watched the debate with my family, though I wish I had done something more productive in that hour and a half, then proceeded to open Twitter and Facebook to see what my friends had thought, many of whom supported Macri and many others who supported the Kirchnerista candidate, Daniel Scioli. Perhaps unsurprisingly, my Kirchnerista friends decided that it had been a complete blowout, Scioli had embarrassed Macri who had successfully evaded every question posed to him by his opponent. On the other hand, my Macrista friends arrived at the same conclusion but with the roles inverted, Macri had blown Scioli, who had tried to dodge every question posed to him by his opponent, out of the water. Did they watch the same debate? Or did they already know the winner before it began? One debate, two opposing conclusions. One nation, two (or more) realities. Ya debería haberlo aprendido... Volver a bloguear después de 4 meses de silencio me deja demasiados espacios para llenar, para evitar aburrirles con un ensayo interminable, escribiré una serie de entradas sobre mi reciente experiencia en los Juegos Panamericanos del 2015 en Toronto, Canadá, junto con un resumen de los meses anteriores a la competencia para no . Otro tema es el orden. ¿Comparto los recuerdos más recientes, o sea los que tengo más claro, o comienzo por el principio, relatando todo cronológicamente? Por favor, bánquenme mientras trato de llegar al mejor formato, lo cual podría ser ni una opción ni la otra sino en realidad una mezcla de las dos. Decir que mis habilidades de "blogueadora" están un toque oxidadas sería poco. Entonces, les pido que me den el "aguante" mientras rompo el hielo con este primer relato. En mi última entrada, les conté de mi vuelta a la cancha en febrero después de haberme operado del ligamento cruzado anterior en julio del 2014 (el 28 de julio hizo ya un año de la operación! ); muchas cosas han sucedido desde entonces. Recuperé la titularidad en River Plate, jugué en mi segundo Superclásico con Boca Juniors que terminó en un empate sin goles y en marzo fui citada para entrenar con la Selección Argentina en preparación para los Juegos Panamericanos en Toronto en julio de este año. Al reflexionar qué escribir, pensé que sería interesante relatar cómo, a pesar de los obstáculos y dificultades, llegué a sentir que cumplí la meta de toda mi vida de representar a la Argentina en una competencia internacional. Pero, gracias a Dios, me di cuenta que, en comparación con las historias de mis compañeras y de jugadoras de otros países que participaron en el torneo, mis luchas no fueron nada especial. Por lo tanto, les ahorraré de mis quejas/fanfarronadas y, en cambio, espero darles una vista privilegiada del fútbol femenino en Latinoamérica y el Caribe. Una de los aspectos más lindos de los Panamericanos, además de la sensación de salir a la cancha adelante de una hinchada de miles (el único partido para el cual se agotaron las entradas fue la final entre Colombia y Brasil, pero el estadio casi se llenaba en todos los partidos del equipo canadiense), fue la oportunidad de compartir y comparar experiencias con jugadoras de las otras delegaciones. A pesar de que no pude hablar con todos los equipos (no tuve la oportunidad de hablar con las de Ecuador, Costa Rica o Canadá, que tiene un sistema parecido al de Estados Unidos para el fútbol femenino), sí pude dialogar con algunas jugadoras de Trinidad y Tobago (T&T), México, Colombia y Brasil. Como los primeros tres equipos estaban en nuestro grupo del torneo, dejaré que el orden de los partidos determine el orden de las entradas. Comenzaré con T&T, nuestro primer partido. El partido terminó 2-2, un resultado bastante injusto debido a un arbitraje abismal (nos anularon un gol por posición adelantada pero en el video se ve claramente que nuestra jugadora estaba habilitada por una defensora, y el segundo gol para el empate surge de un tiro libre regalado por una falta inventada en los últimos segundos)... Aún así, a pesar del resultado, fue un buen comienzo para un equipo (nuestro) que no había jugado ni un solo amistoso internacional en los meses anteriores al torneo y que tenía (y tiene) un cuerpo técnico que realmente empezó a trabajar con la selección a partir de marzo 2015 (fue contratado en noviembre-diciembre del año pasado pero solamente trabajaron un par de semanas a fin de año antes de un torneo amistoso en Brasil en diciembre). El resultado, sin embargo, es menos interesante de lo que me contaron los trinitenses. Cuando le pregunté a un miembro del cuerpo técnico sobre la situación del fútbol femenino en su país mientras hacíamos cola para el desayuno, me respondió que en general no era bueno, PERO que 2015 marcaba el primer año de la liga profesional de mujeres en T&T. En uno de los últimos días tuve la oportunidad de charlar con una de las jugadoras más experimentadas de la Selección Trinitense, Ahkeela Mollon, quien jugó fútbol en la primera división de la liga universitaria en EEUU y luego continuó su carrera de jugadora en Islandia y en Suecia antes de volver a su país para participar en la nueva liga profesional y entrenar con la Selección. Aunque no me contó mucho sobre el desarrollo de jugadoras—mejor dicho ligas inferiores para niñas antes de llegar a los niveles más competitivos—, sí habló sobre las diferencias entre sueldos en los países donde había jugado, tanto de los clubes como de la Selección. En realidad, la conversación comenzó con una serie de preguntas por su parte: "¿Cuánto ganan jugando en Argentina? ¿En qué clubes juegan ustedes? ¿Cuánto les paga la Selección?" Cuando le respondí con el monto de mi verdadero "sueldo" en River Plate, no podía disimular la expresión de shock en su rostro y tampoco pudo contener su siguiente pregunta: "¿Qué carajo hacés jugando en Argentina? Le expliqué que en Argentina no existe el fútbol profesional tal cual sino el nivel más alto es una liga amateur con algunos clubes que pagan viáticos, River es uno de esos clubes que pagan viáticos o "becas deportivas" y las jugadoras recibimos un promedio de 800 pesos "mensuales" (menos de 60 dólares americanos), un monto que varía dependiendo de las citaciones de la jugadora, su asistencia a los entrenamientos, etc., pero para este año (estamos casi en agosto), el club solamente nos pagó 3 meses de beca (hasta abril). Luego me preguntó cómo era el costo de vida en Argentina, y le expliqué que era menos que en EEUU pero que sería imposible vivir del viático del club (no sólo porque es poca plata sino también porque nunca sabemos cuándo nos van a pagar), más que un sueldo, el viático es como una ayuda que viene de vez en cuando para darte un gusto o cubrir algún gasto inesperado. Lógicamente, supuso que River era un club chico porque no lo conocía por nombre, pero cuando le mostré unas foto del Monumental, el estadio más grande de la Argentina, una del aspecto impresionante desde afuera y una desde adentro durante un Superclásico, su asombro inicial se transformó en indignación. 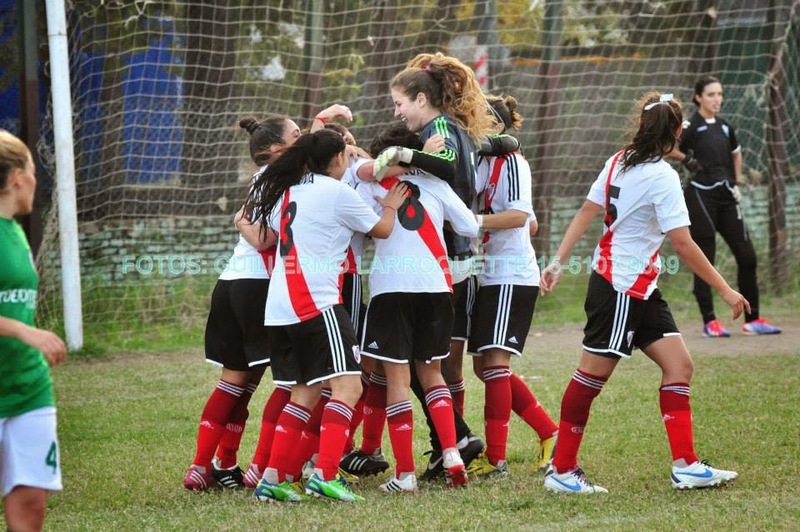 Ahkeela no llegaba a entender cómo un club tan grande como River Plate no podía invertir más en su equipo femenino. Me contó que su club pagaba entre 800-900 dólares americanos mensuales a sus jugadoras y a la vez cubría casa, comida y costos de transporte. Sin embargo, existen unas diferencias claves entre el fútbol femenino en Argentina y T&T como la estructura del campeonato y la fuente de los sueldos. Mientras que en Argentina los viáticos y beneficios provienen del club (y también hay mucha diferencia entre lo que ofrecen los clubes en el campeonato, desde los clubes donde las jugadoras tienen que pagar los colectivos para viajar a los partidos de visitante hasta clubes que ofrecen becas de estudio en universidades privadas como River Plate y la UAI Urquiza y otros que otorgan no solo cobertura médica sino una obra social completa a sus jugadoras), en T&T los sueldos son pagados por el gobierno nacional. En T&T, la liga profesional está compuesta por 5-6 equipos, pero en Argentina actualmente hay 18 equipos en el torneo oficial de AFA, lo cual implicaría una diferencia significativa en términos de cuántas jugadoras cobrarían y la cobertura otros gastos relacionados. Luego, sus preguntas se orientaron hacia la Selección ya que seguramente tenía que ser mejor que la situación de los clubes... Y mientras que económicamente es mejor, no es por mucho. Durante los meses previos a los Juegos Panamericanos, las jugadoras de la Selección Mayor recibíamos 140 pesos por entrenamiento (aproximadamente 10 dólares americanos) que nos pagaban el último día de cada semana y mientras estábamos en Canadá nos pagaban un viático de 230 pesos, o sea un total de menos de 5000 pesos (~350 dólares americanos) a lo largo de tres semanas. Algunas jugadoras que habían jugado en los Juegos ODESUR el año pasado recibían una beca deportiva de 4500 pesos del ENARD (Ente Nacional de Alto Rendimiento Deportivo), una organización sin fines de lucro ligada al Comité Olímpico Argentino y la Secretaría Nacional de Deporte que otorga becas deportivas a deportistas que participen en deportes y competencias olímpicos. Esta beca que incluye obra social y para la Selección Femenina de Fútbol, que no tiene una competencia internacional hasta 2018, hay una alta probabilidad de que se corte después de la revaluación de becas en agosto (ahora). Nuevamente Ahkeela quedó asombrada después de escuchar nuestra aclaración y exclamó que nadie en el equipo trinitense hubiera viajado por un monto tan chico. Ante situaciones parecidas, ellas hicieron paro y se negaron a subir al avión hasta llegar a un acuerdo que les convenía y la federación escuchaba las demandas de las jugadoras. Ahora fue nuestra chance de quedarnos asombradas. La idea de negarse a subir al avión para demandar aumentos de viático nos resultó completamente extraña, extrema y, sobre todo, imposible de aplicar en Argentina. En River, habíamos considerado hacer huelga para que se mejoraran las condiciones médicas pero al final no la hicimos por temor a que sacaran del todo a la disciplina para reducir gastos en el club, y temores parecidos con AFA nos detuvo hacer semejante protesta. A pesar de que mi conocimiento del fútbol femenino trinitense sea limitado, parece que ha progresado bastante desde el Clasificatorio al Mundial de CONCACAF de octubre 2014 pasado cuando el DT voluntario, un ícono en el fútbol femenino estadounidense, Randy Waldrum, tuvo que solicitar donativos a través de Twitter para poder pagar los costos de comida y alojamiento del equipo ya que la federación había mandado la delegación con solamente 500 dólares americanos y sin materias de entrenamiento para su estancia en EEUU a lo largo del torneo. El pedido—exitoso ya que varias federaciones, incluyendo la de Haiti, donó para apoyar a las jugadoras—inicialmente incitó una respuesta de enojo de la federación y del gobierno nacional de T&T, pero posiblemente fue el toque de atención necesario para estimular inversión y apoyo para el deporte con la fundación de la liga profesional. Estoy siempre a favor de aprender y adoptar ideas exitosas de otros países, pero todavía es muy temprana en mi "investigación" para poder llegar a cualquier tipo de conclusión. Esperemos hasta que veamos las situaciones de un par de naciones más antes de decidir qué teorías y prácticas podrían ser aplicadas al fútbol femenino argentino. I should have learned my lesson. Blogging after about 4 months of silence leaves a lot of holes to fill in, which is why I'm going to write a series of posts about my experience at the 2015 Pan American Games in Toronto, Canada, as well as a summary of the months leading up to the competition, so as not to bore you with one long novel. Another issue is the order. Should I share about what's freshest in my memory or should I write chronologically? I hope you can bear with me as I work towards the best format, which may very well be neither one option or the other but actually a blend of the two. To say my blogging skills are rusty would be a severe understatement... So please bear with me through this ice-breaking post. In my last post, I shared about my return to playing in February after ACL surgery in late July 2014 (almost exactly one year ago today), but much has happened since then. I earned back the starting position at River Plate, played in my second Clásico against Boca Juniors which ended in a 0-0 draw, and got the call up to train with the Argentine Women's National Team as of March to prepare for the Pan American Games which were held this past month in Toronto. When I first began brainstorming for this post, I thought it would be interesting to talk about how despite the obstacles and struggles along the way, I was finally able to reach my goal of representing Argentina in an international competition. However, thankfully I saw the light and realized that my struggles and obstacles honestly pale in comparison to those of some of my teammates and of many players from the other teams at the tournament. So, I'm going to spare you my whining/"humble-bragging" and instead hope give you an insider's view of women's soccer in Latin America and the Caribbean. One of the best aspects of the Games, besides the feeling of walking onto the field in front of a good-size crowd (the only sold-out match was the final between Colombia and Brazil, but Canada always drew impressive audiences too), was having the opportunity to share and compare experiences with players from other countries. Even though I wasn't able to speak to every team (I didn't get the chance to talk with players from Ecuador or Canada- which has a youth/women's soccer system similar to that of the U.S.A.), I was able to talk with players from Trinidad & Tobago (T&T), Mexico, Colombia, and Brazil. Since the first three teams listed were in our group, I'll let the order of the games determine the order of the posts. I'll start with T&T, our opening match. The final result was an unfair 2-2, due to poor refereeing (we had a goal called back for offside which on the replay was very clearly a legal goal and the second goal scored by T&T was in the last minute of stoppage time on an invented free kick)... Even so, despite the result, it was a good start for a team which had not played any international friendlies in the months leading up to the tournament and had only been working with the current coaching staff since March 2015. The result, however, is less interesting than what the Trinidadians told me. When I asked one of the coaches about the status of women's soccer in his country while waiting in line for breakfast one morning, he told me that in general it was not good, BUT 2015 was the pilot year for a professional women's league in the country. Later, I had the chance to talk to one of the most experienced players on the Trinidadian team, Ahkeela Molon, who played college soccer in the United States and then went on to play professionally in Iceland and later in Sweden before returning home to join the newly formed league and to train with the national team. While she didn't share much about the levels of player development, more specifically about youth divisions for women, she did talk about her salaries at various clubs and with the national team. The conversation actually began with a series of questions from her side, "How much do you earn in Argentina? What clubs do you play at? How much does the national team pay you?" When I told her the sad truth regarding the "pay" at River Plate, she couldn't hide the look of shock on her face and the automatic question which followed "What the heck are you doing in Argentina?" I had told her that we aren't actually professional, but at River we receive a "monthly" stipend which averages around 800 pesos (less than 60 U.S. dollars), varying slightly depending on player performance, practice attendance, etc., but for this year we've only been paid through March or April. She then asked what living costs were like in Argentina, and I explained that they were much less expensive than in the United States, but the stipend from the club doesn't even come close to covering costs; it's more like a small help which comes every once in a while. Logically, she assumed that the club was a small one since she had never heard of it, but when I showed her a picture of the stadium, one of the outside and one of the inside during a Superclásico, the look of shock dissolved only to be replaced by one of disgust. Ahkeela couldn't believe how a club as big as River Plate could not afford to invest more in its women's team. She said that her club paid roughly the equivalent of 800-900 U.S. dollars per month while also covering housing, food, and travel expenses. However, the key difference between Argentina and Trinidad was the source of the salary as well as the number of teams in the league. While in Argentina the "salary" or "stipends" for players are determined and covered (or not) by the clubs, in T&T the money comes from the national government. In Argentina, however, there are currently 18 teams in the "official" league, in T&T there are only 5-6 teams in the professional league, a significant difference in terms of how many players are on salary and other general costs to be covered. Her questions then turned towards the national team because surely it had to be better than the situation at the clubs... While it is better, it's not by much. During the months leading up to the tournament, we received a daily stipend of 140 pesos (approximately 10 U.S. dollars) to be paid at the end of each week and while traveling we received a daily stipend of 230 pesos for a total of just under 5000 pesos (approximately 350 U.S. dollars) over 3 weeks. Some players who had been on the squad since the ODESUR competition last year had been receiving a monthly scholarship of around 4500 pesos from ENARD (National Entity of High Performance Sports), the organization connected with Argentine Olympic sports and performance, a scholarship which will be up for reconsideration in August since women's soccer does not have another olympic-related international tournament until 2018. Again our explanation was met by surprise as Ahkeela exclaimed that no one on the Trinidadian team would have even traveled for such poor pay. When they had faced similar situations, they went on strike and refused to board the airplane until an agreement was met and their federation responded to the players' demands. Now, it was our turn to be shocked. The idea of refusing to board for insufficient pay seemed completely foreign and impossible to apply in Argentina. At River, the players considered refusing to play until the medical situation was improved, but we never carried it out for fear that the club would just get rid of the team entirely to cut costs, and similar fears with the Argentine Football Association prevent us from carrying out such a method of protest. Even though my knowledge of women's soccer in T&T is limited, it seems as though strides of progress have been made since last year's CONCACAF World Cup Qualifying in October when the Trinidadian's volunteer coach, a legend in U.S. women's soccer, Randy Waldrum, was forced to ask for donations via Twitter to cover the team's food and housing costs since the federation had sent the team with only 500 U.S. dollars and no training equipment for the duration of the team's stay in the United States. The appeal for help initially led to an angry response from the T&T government and soccer federation, but it might have been the necessary wake-up call to invest and provide more support for the growth of the sport with the foundation of the professional league. I'm all for learning and adopting ideas from other countries which have been proved to work, but it's still early in my "investigation" into women's soccer to draw any sort of conclusions. Let's wait until we hear about a few more countries before deciding which ideas could be applied to el fútbol femenino in Argentina. After an unjustifiably long hiatus from blogging, I'm back and determined to post with a more reasonable frequency—one which is yet to be determined. I know that in my last post I promised to talk about love, but I've changed my mind since then (don't fret my dear friends, the loooooove post will come eventually) since I have some other news to report. Almost 8 months ago, on June 8, 2014, during a game against Estudiantes de La Plata in Buenos Aires, Argentina, I tore my ACL (anterior cruciate ligament), MCL (medial cruciate ligament), and meniscus in my left knee. I was then operated on just over 6 months ago on July 28, 2014 in Dallas, TX, USA. Despair, pain, and fear ruled my emotions, and the light at the end of the tunnel seemed infinitely far away. Well, I'm happy to say that I've reached the other side of the tunnel, and the light is even brighter than expected. While missing out on some big games and international tournaments was certainly frustrating, through the surgery and rehabilitation process I know I was able to grow immensely, overcoming the physical and emotional hurdles which come with a such an injury. I learned how setting and working diligently toward short term goals while maintaining the end goal in focus is essential to success. I learned how patience and trust in those with previous experience and wisdom (in this case the surgeon, Dr. James Montgomery, and the physical therapists at TOA/D1 Dallas who guided me through the process) is better than rushing and trying to do things on one's own. I learned how depending on family and friends in tough times is not a sign of weakness but instead a necessary reminder of how life is best lived in community. Also, to everybody who encouraged me throughout these last 8 months, from family to friends (in the US, Argentina, Romania, and all over the world) to teammates to coaches to rivals and to those who don't fit into any of those categories, thank you. We tend to underestimate the power of words and their ability to influence for good or evil, but during my recovery, the messages of encouragement were invaluable to me, pushing me onwards even when things got painful, frustrating, or even repetitive and boring. So, to those who are at some point along the ACL rehab process, take this blog as just that, a word of encouragement to keep going even when you don't want to think about doing another leg raise or single leg squat. Looking back, the months since my injury and surgery appear to have flown by, although I know that in the moment, the days seemed to crawl by at times. Now, finally cleared to participate in practices (non-contact for the first couple weeks), it almost feels as though I was never hurt, that I'm starting a new season just like the rest of my team, trying to earn my spot back on the field and working towards our goal of winning the league championship. As of now the only thing I can report is that after a week and a half of preseason with my team (Club Atlético River Plate of Buenos Aires, Argentina), I feel just as I should: sore all over but happy to be playing again. September 11th was the opening day of the Copa América Femenina 2014 in Ecuador. For those of you who don't know, it's the South American Women's Soccer Championship, almost more importantly though, it's the qualifiers for the 2015 Pan-American Games, the 2015 Women's World Cup in Canada, and the 2016 Olympics in Rio de Janeiro. In case I wasn't clear enough, it's a BIG deal. The format is completely different from men's World Cup and Olympic qualifying which are separate events. Men's South American qualification is drawn out over months of play where each team plays each other twice, once at home and once away. The men's Copa América is more for bragging rights than anything else. For the women, it's a brutal and brief tournament, with no room for error. The ten teams of the South American Football Federation (CONMEBOL) are divided into two groups, Group A and Group B. This year, you could say the split wasn't too even. Three of the top four finishers of the last Copa América in 2010 were drawn into Group B: Argentina, Brazil, and Chile, which are joined by a strong Paraguay and a not-so-strong Bolivia. Group A is made up of Colombia, Ecuador, Perú, Venezuela, and Uruguay; Colombia is the only team of that group to have qualified for a Women's World Cup while the others are still up and coming. Only the top two teams of each group move on to the knockout round where the winner of one group plays the other winner to decide which teams will face off in the final on September 28th. The first and second place finishers qualify directly for the World Cup while the third place team must play a play-off with a team from CONCACAF (The USA's federation). As the host nation, Brazil is already qualified for the Olympics so only one spot remains (if Brazil finishes outside the top two, only the first place team qualifies). The entire top four qualifies for the Pan-American Games. After losing their first game against Chile 0-1, the Argentine women redeemed themselves with two solid wins, thumping Bolivia 6-0 (with a hat trick from my friend and River Plate teammate Mariana Larroquette) and holding off a resilient Paraguay 1-0, which has kept them in the running to finish in the top two of the group. Their hopes have been especially helped by a 2-0 Brazil victory against Chile on Thursday night, which also gives Paraguay a slight chance to make it through. If Argentina wins its last match, which will be against the ever-powerful Brazilians, they have a great chance at going through, though their fate still depends on the score of the other game on the last day: Chile-Paraguay. Well, I don't want to bore you with all the details about Argentina's chances of classification, but I did want to point something out. Not even one of Argentina's games has been broadcast on television, not even online. It's truly something CONMEBOL should be ashamed of, and there's no other way to say it. The teams participating in this tournament—I'm going to focus on Argentina since I know most of the girls—deserve the support of their countries. I would be willing to bet that 99% of Argentina doesn't even know the tournament is going on right now, yet during the men's qualifying for the World Cup in Brazil, we can be sure that not only did 99% of the country know it was happening, but it also knew Argentina's status and actively followed the progress of their national team. The only ways to follow the women's games is by listening to a radio transmission or by social media; both of which are torture. Nervous doesn't even describe how I feel each time Argentina plays. During the game against Chile, I almost tore all my hair out—okay, I may be slightly exaggerating, but I did consider it once or twice...—and the 1-0 scoreline against Paraguay kept me anxious for the entire 90 minutes. Supporting the team long distance, with extremely limited information, is not for the faint of heart. Maybe I would still suffer watching the games online or on television, but at least I would be able to come to my own conclusions about the game and not only have to believe what someone else thinks about each player's performance. I think I already scared my parents a few times celebrating a goal, growling from frustration, or yelling about a missed shot or a save by the opposing goalkeeper. I admit that this post is a little all over the place, without a well-defined path, but I think it's a good representation of the transmission of information (or the lack of it) regarding this tournament which will decide the next four years for each national team participating. If you get anything out of this, let it be my support for the Argentine women. We're with y'all (sorry, a little Texan just came out...)! El 11 de septiembre, o sea hace una semana, arrancó la Copa América Femenina 2014 en Ecuador. Para los que no saben, es el campeonato sudamericano de fútbol femenino y sirve de eliminatoria para los Juegos Panamericanos 2015, la Copa Mundial Femenina Canadá 2015 y los Juegos Olímpicos 2016 en Río de Janeiro. No sé si quedó claro: es un torneo importante. No tiene nada que ver con el formato de las eliminatorias masculinas del CONMEBOL (la federación de fútbol en Sudamérica). Es un torneo corto y brutal, sin margen de error. Los diez equipos de la federación se dividen en dos grupos, A y B. Este año, se puede decir que la división no fue tan pareja. Tres de los primeros cuatro de la última Copa América (2010) tuvieron que enfrentarse en el grupo B: Argentina, Chile y Brasil, los otros dos equipos son Paraguay y Bolivia. Del otro lado están Colombia, Ecuador, Perú, Venezuela y Uruguay. Solamente los primeros dos equipos de cada grupo progresan a la etapa final donde el ganador de grupo A juega contra el segundo de grupo B, y vice versa. Los cuatro equipos finalistas clasifican a los Juegos Panamericanos. Brazil, como anfitrión, y un equipo más clasifican a los Juegos Olímpicos. Los dos equipos finalistas clasifican directamente al Mundial y el tercer equipo tendrá que jugar una eliminatoria contra un equipo de la CONCACAF. Después de perder su primer partido con Chile, Argentina se reivindicó con dos victorias, ganando 6-0 con Bolivia (con 3 goles de mi compañera de River y amiga Mariana Larroquette) y luego 1-0 con Paraguay y todavía le queda la esperanza de salir del grupo. Si ganan su último partido, que será contra las poderosas brasileras, tienen muy buen chance de progresar, pero todo también depende de lo que pasa con el otro partido de la última fecha: Chile-Paraguay. Bueno, no les quiero aburrir con todos los detalles y situaciones de clasificación para Argentina, pero sí quería destacar algo. Ningún partido argentino ha sido transmitido por televisión. Es una vergüenza, no hay otra forma de decirlo. 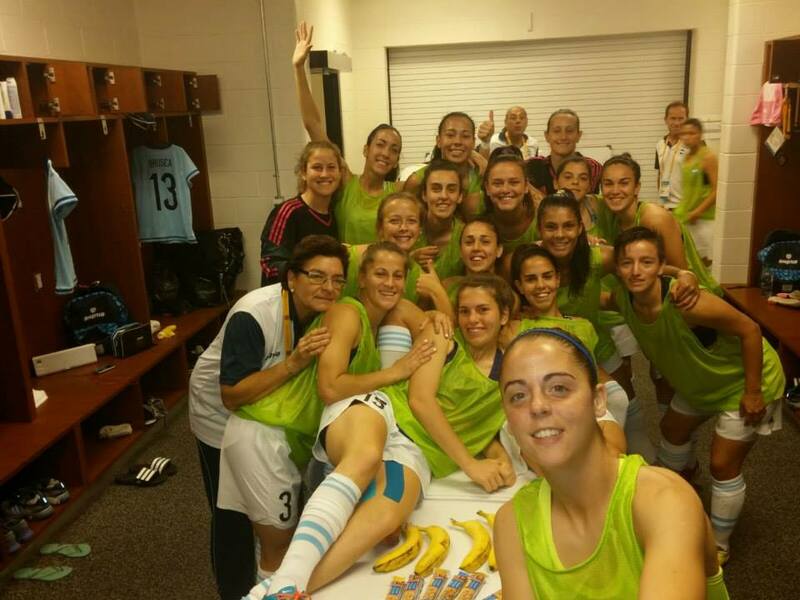 Las chicas de la Selección merecen el apoyo de su país. Apostaría que el 99% de argentinos ni saben que se está jugando la Copa América Femenina, pero durante las eliminatorias masculinas para el Mundial de Brasil de este año, el 99% del país no solamente sabía sino que también veía los partidos y seguía el progreso de su Selección. Las únicas formas de seguir los partidos es por la radio y las redes sociales, y ambas formas son una tortura. Los nervios me consumen cada vez que juega Argentina. Casi me arranco los pelos durante el partido con Chile y también en el de Paraguay. Alentar de lejos, con información muy limitada, no es para débiles. Capaz que mirar por televisión también me daría la misma sensación de impotencia, pero por lo menos podría sacar mis propias conclusiones del partido y no solamente saber quiénes y cuándo hicieron los goles. Creo que ya varias veces los asusté a mis viejos, gritando un gol, lamentando un gol errado o atajado. Admito que es una publicación un poco dispersa, sin un rumbo bien definido, pero creo que representa bien la transmisión de información (o la falta de transmisión de información) sobre este torneo tan importante para el fútbol femenino sudamericano. Si sacan algo de estas divagaciones, que sea mi apoyo a las chicas albicelestes. Estamos con ustedes chicas. Football and Friendship, what more does one need? After reading my last post, it’s very possible, and even more so for those of you who don’t play soccer or have a direct connection with women’s soccer, you have been wondering why the heck does this girl care so much about soccer? Why does she get so excited about a sport that, even though it is the world’s most popular sport, at the end of the day is just a game? I could tell you it’s because of the competition, the adrenaline pulsing through my veins when I make my way onto the field, shake hands with the opponent and wait anxiously for the referee’s whistle to signal the beginning of the match, the emotion which takes over after a spectacular save which leaves the opposing fans in silence after they had started to cheer just a second too soon, the feeling of pure joy after winning a championship, a clásico, a hard fought game. I could tell you it's because of the life lessons soccer offers such as hard work, dedication, healthy lifestyle, punctuality, patience, and sacrifice. I could even tell you it's because of the recognition which comes with being a female athlete, but then you'd really realize I would be lying. I'm not saying that those are not valid motives, nor that they do not contribute significantly to my love for soccer, but none of them is the main reason—I recognize that love often cannot be explained by reason, but sometimes it can, as in this case. If my love for soccer was for any, or even all, of the reasons listed above, I would have stopped playing years ago; I might not have even finished playing out my four years of college eligibility. No, if it was for any of those reasons, I would definitely not be writing this blog, living in Argentina, and playing at River Plate; I would most likely be in medical school somewhere in the US, which my parents might have preferred, but that's another story... Anyway, why am I saying all this? This past weekend, my best friend came to visit me, another player who, like me, is not yet ready to hang up her cleats and leave the game behind. We met at my first college, the University of South Florida, where I studied and played for two years before transferring to Rice University (no it's not named after the food...). We weren't close friends from the start; it took a little while for us to realize we had a lot in common: our faith, our way of thinking, goals, values, sense of humor (okay, I would like to think that, but the reality is she's way funnier than I could ever hope to be), among many other things, but on the field, the situation was completely different. She was our starting defensive center midfielder, was named captain her freshman spring, and was a consistent figure for the team throughout her four seasons while I mainly maintained a marginal role, on the sidelines if you will, as the backup for our ridiculously athletically talented starting goalkeeper. Despite the differences in our college soccer careers, we became friends, and, since then, our friendship has continued to grow. I consider her my sister, a blessing from God, and we are united by an intimate bond which I'm sure will last a lifetime. Well, all this to say that, in my opinion, what makes soccer so special are the relationships which are born and cultivated through it. I use my best friend as an example but I could tell you countless stories of other footballing friendships and relationships which have influenced and molded me in some way. I remember goofing off with my high school soccer teammates at practice and on road trips, hanging out with my sister who was also on the team and realizing she was actually not as dorky as I had imagined but really one of the wittiest girls I've even known (don't get too cocky while reading this, Vanessa...). I remember how at Rice, despite having a miserable soccer career and experience—easily the worst two years of soccer of my life—I met friends, professors, and mentors who inspired, challenged, and loved me and continue to do so today. I vividly remember taking off from the international airport in Buenos Aires in 2011, leaving behind my second time training with the Argentine Women's National Team. I can picture the scene exactly, looking out the window at the endless city lights illuminating the pitch black with tears rolling down my cheeks, not because of the disappointment of not being able to continue training with the national team due to complications and delays in the citizenship process but because of the pain of leaving the girls behind, especially not knowing when, or if, I'd see them again (now there are a few I see too often at River... I'm just kidding, I love them and they are a huge blessing in my life). Even more recently, it's impossible not to mention the support my teammates at River have given me since my injury through messages, hugs, and a even huge banner held before the first match I had to miss. I know I can count on them through the whole rehabilitation process until I'm back on the field. 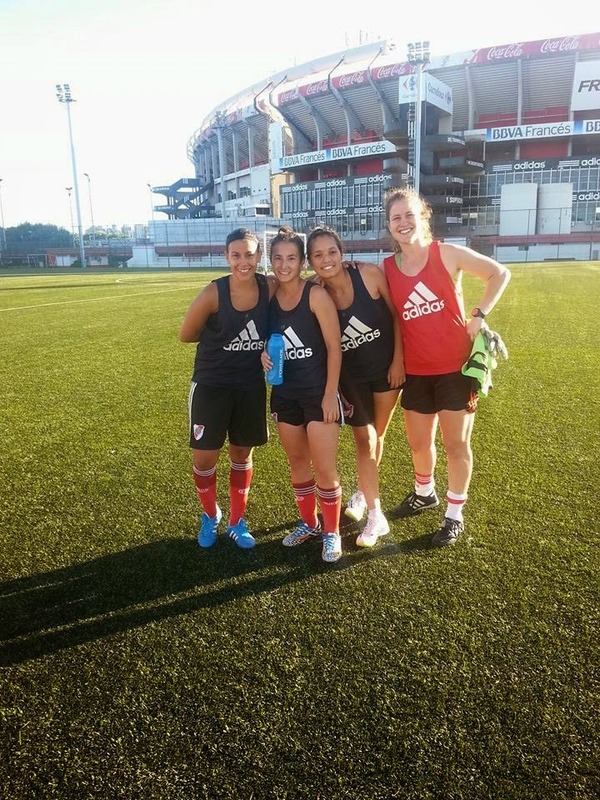 They're my millonaria sisters ("millonario" is a nickname for players and fans of River). It's moments like these which come to my mind when I think about soccer, even more so than images of games won or lost, than the fleeting feelings of frustration or joy, than memories of innumerable training sessions and matches. Friendships are the essence of soccer, and I thank God for having given me the opportunity to meet and learn from so many amazing people through this beautiful game.